“Pianist Hung-Kuan Chen’s career - as well as his life -- has been a vivid example of the concept of yin-and-yang. In that Chinese philosophy, apparent opposites are actually complementary: each fulfills a need in the other; one cannot exist without the other. Mr. Chen embodies a synthesis of seeming opposites that coalesce into a unique artistic personality. 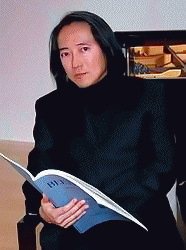 One of the most honored pianists of his generation, Mr. Chen won top prizes in the Arthur Rubinstein, Busoni, and Geza Anda International Piano Competitions, and in the Young Concert Artists International Piano Auditions. He also won prizes in the Queen Elisabeth, Montreal International Musical and Van Cliburn International Piano Competitions, as well as an Avery Fisher Career Grant. National Concert Hall in Taipei, Shanghai Concert Hall and the Forbidden City Concert Hall in Beijing. He was the first to perform the Rachmaninoff Third and Beethoven Fourth Piano Concertos in Taipei, and gave the Shanghai premiere of the Bartók Second Piano Concerto. His plans for the 2015-2016 season include solo and orchestral performances in China and Switzerland, in Boston, and at Aspen and Yale. He is also preparing new recordings to be made in Switzerland in 2016. Hung-Kuan Chen has enjoyed fruitful artistic collaborations with, among others, Christoph Eschenbach, Hans Graf, George Cleve, Joseph Silverstein, David Shifrin, Roman Totenberg, ChoLiang Lin, the Shanghai Quartet, Sui Lan and Andrew Parrott. His most meaningful artistic partnership is with his wife, Tema Blackstone, with whom he frequently performs as a piano duo. Summer Institute in New Paltz, International Music Akademie in Lichtenstein and Aspen Music Festival. Among notable pianists he has taught or coached are Yuja Wang, Sean Chen and Niu Niu. In 1992, Hung-Kuan Chen suffered a hand injury which caused neurological damage and eventually resulted in focal dystonia. Through meditation and his own unique research, he was able to heal and return to his life as a concert artist. His first post-accident solo recital in 1998 received rave reviews and he was described as a transformed artist. A many-faceted individual, Hung-Kuan has painted and drawn, danced, and played several other instruments. He is a serious chef, bakes his own bread and homebrews beer. He is an artisan of home improvement, a skilled woodworker and an electronics whiz. He is a meticulous piano tuner, a knowledgeable jazz enthusiast, and an avid hiker. He brings the same level of curiosity and dedication to both spiritual and worldly pursuits.